While I am here to learn, I am also here at Marist to make memories that will last a lifetime and while this next memory might not be a traditional college one that people make, it is definitely one worth sharing with Red Fox Nation! Before I get into detail however, there are a few things that you readers should know about. First off, I am 6’3. I am a tall adult. Secondly, I consider myself a fairly athletic person. Thirdly, my feet have never touched ice. Seriously.I played sports growing up, and I still participate in intramural sports here on campus. So when my friend Zach approached me about ice-skating at the Mid-Hudson Civic Center, I was extremely hesitant. The last time I did anything remotely close to ice-skating, I ended up with a broken collarbone at the age of 4. My mother and father will both verify that us Brosseau’s are not meant to skate. We are genetically inclined to avoid it, and stick to recreational activities on land. When I called my father to tell him I would be going ice-skating, his immediate response was to bring my Health Insurance card. My father is the most supportive man I know. Snaps for Robert! As we pulled into the Mid-Hudson Civic Center, I became extremely nervous. How did I manage to get pulled into actually doing this? I told Zach that if I got hurt, he was bringing me to the hospital. Along with us were our friend Kelsey, and a few other friends of Zach. 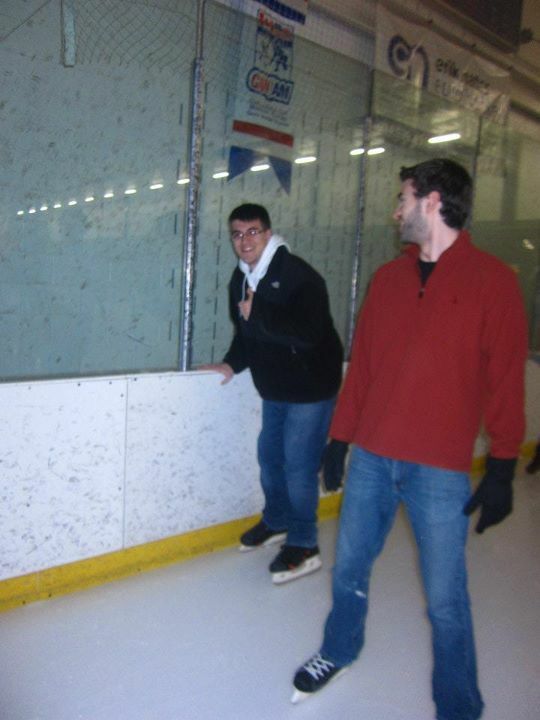 I was the only one who had never ice skated before, and I was slowly becoming more and more nervous. My genetics were kicking in and telling me to RUN the other way and not too look back. At this point, we were already in the rink and I had already laced up my skates. The only thing left to do was to actually…go on the ice. Let me tell you Red Fox Nation, I severely underestimated the difficulty of ice-skating, a LOT. I thoroughly regretted my decision to do this the second I hit the ice. Knowing me all too well, Kelsey and Zach refused to let me back out of it and encouraged me along the way. By the end of the night, I had only almost fallen once, had no broken bones, and avoided hurting anybody else. While I’m glad I faced my fears and manned up to accomplish something, you better believe I was the first one off the ice. I even took a quick nacho break. 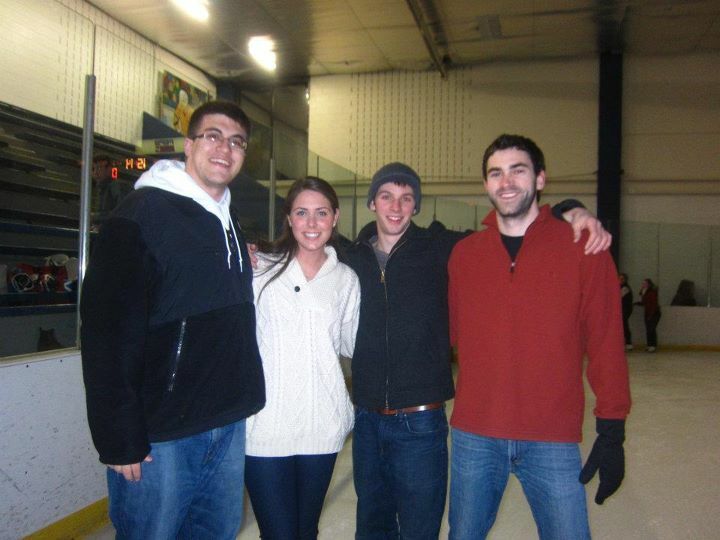 I thank Zach and Kelsey, two of my best friends here at Marist, for making me go ice-skating. They are both Juniors, and while I am only a “Sophomore”, we’re a family and they take care of me more than I care to admit. So while I didn’t officially thank them, they know I appreciate them more than words in the Webster Dictionary can explain;) Kelsey, or as you may know her, “Galway Girl”, is back from a semester abroad in Galway, Ireland, and Zach and I have been long awaiting the day for her to come back so the three of us can hang out together. Sometimes, it isn’t what you’re doing, but rather whom you’re doing it with that can make something special. Excuse the cliché, but I believe every word of it! I’m proud of myself for facing my fears. As I get “older”, I know that I can’t let things intimidate me and prevent me from experiencing new things. While people usually may tackle ice-skating at a younger age(evident by the 5 year old who caused me to fly into the boards last night…speed demon! ), it is never too early to face a fear and conquer it. I can successfully check ice-skating off my list of things I have never done! But listen to me now Red Fox Nation, when I say it will probably be the first and ONLY time I ever go ice-skating. Well Red Fox Nation, that wrap it up for me! Time to hit the books! March 20, 2012 in Fox Tales News.